Are you ready for begin your fairy garden adventure? 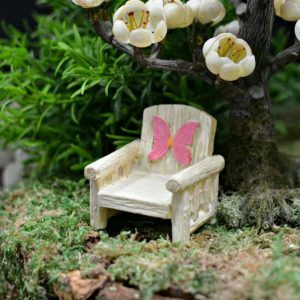 Every fairy garden is as special and unique as the person creating it. 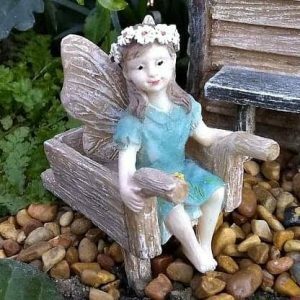 Our fairy garden tips are here to inspire you and provide some general guidance. If you are creating with kids, take a look at our special childrens section. 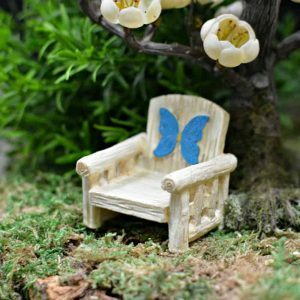 Our Fairy Garden Learning Centre is loaded with cool info and helpful advice, so be sure to visit and check back regularly for updates and added resources. There is more to a fairy garden than just the fairies! Very important (and a little less exciting) components like containers and plants need to be considered. So, let’s begin with the basics…. It might be tempting to pop down to your local hardware store and grab a container, but take a look around home first. Old wheelbarrows, drawers, wooden boxes, birdbaths – they all have a previous life and their story will add another chapter to yours! Consider re-using and re-purposing, even if they are broken. Broken items can be mended or featured and the results can be amazing (because we all love broken pot gardens). If you havent read our product care guide yet, now is the right time to head over there. In the guide, I offer some important fairy garden tips on mindful positioning of your ornaments. Garden beds are a great option, especially for kids. They usually have the space for your fairy garden to expand over time and ground level gardens allow easy access for your children. Think teacups, decorative bowls, terrariums… any container will work. If you are using real plants, your container will need a drainage hole. 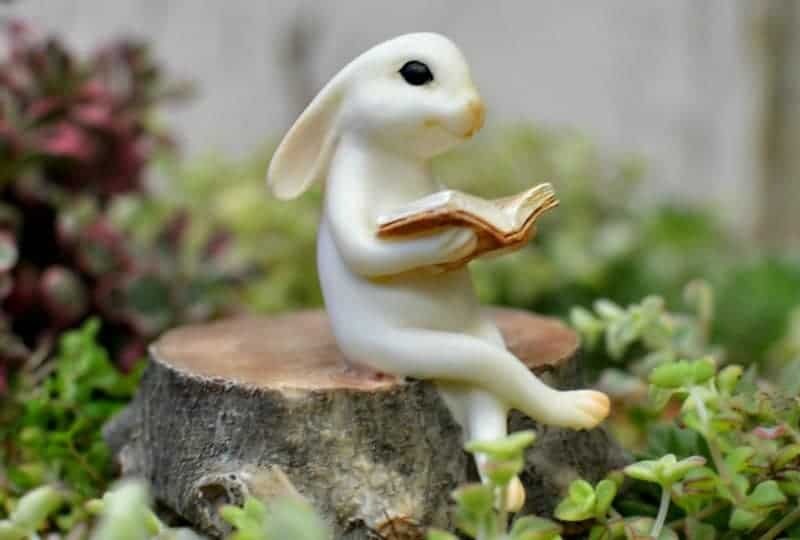 Fairy gardens add magic to any space – think window sills, coffee tables, patios, book shelves. Even though I am often asked, I am reluctant to suggest that any particular plants might be better options than others. Australia is a huge place that covers a massive range of environments, so plants that thrive in far north Queensland may not do as well in our alpine regions. Choosing plants that grow well in your region is always the best option and the staff at your local garden centre are a great resource. If you are creating a garden with a child, you will have loads more fun if you take them with you! (seriously, got a neice, nephew, friends kids, take them too!) Children love garden centres. Prior to arrival, charge them with the task of choosing plants that the fairies love most. Children are very good at this. Encourage them to feel the texture of the leaves, smell the leaves and blossoms, look at the shape and patterns of the leaves, learn about the needs of each plant by asking the staff or reading the pot tags. Find out if it will grow well in your creative space – does it like sun or shade? Plants with small leaves, bonsai and slow growers are pretty in a miniature garden, but remember that the fairies love all plants. They do not discriminate because of size, colour or variety. It is not necessary to keep your plants in scale with your garden. In fact, larger leafy plants will create shade and shelter, protecting both the enchanted residents and ornaments. I am particularly fond of creeping ground covers. They tend to grow quickly and their fine root system aides secure positioning of products with stakes. You might consider sticking with a certain theme. For instance, a herb garden looks beautiful, smells amazing and brings the magic into your kitchen (and belly!). Potted colour is eye catching and instantly rewarding. Succulent gardens are low maintenance and their other-worldly shapes add intrigue and a touch of quirkiness. It is critical that you follow the safety advice on the packaging of potting mix. Particals within these products can become airborne during transfer from bag to container. A dust mask, gloves and safety glasses should be worn. For any further advice on this, read the product packaging, contact the product supplier, or chat with the staff at the place of purchase. Real plants may not always be the right option for you because of allergies, location, etc. Artificial plants are a good alternative and work especially well in container gardens. You can find examples of high quality synthetic plants here. Moss adds a touch of woodland whimsy to any fairy garden. Live moss is ideal but not always an option. You can read more about live moss here. If live moss is not an option, think about using preserved moss. You can find out more about preserved moss here. Now that we have the garden sorted – let’s dial up the magic and turn it into a fairy garden! There is no right or wrong way to choose your features and elements. Afterall, this is your space where you are telling your story. If it makes your heart smile, you are doing it right. Remember, you can always move things around and change your landscape at any time. 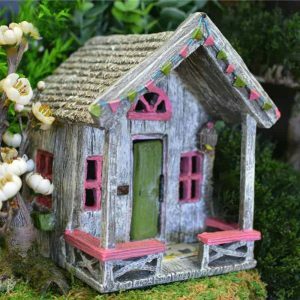 The focal point is the largest feature in your garden and is often a fairy door or fairy house. It is the place where all adventures begin. While I advice choosing a house with your heart, it might happen that you have size restrictions, so always check the dimensions on the product listing to ensure that the house you choose will fit your space. 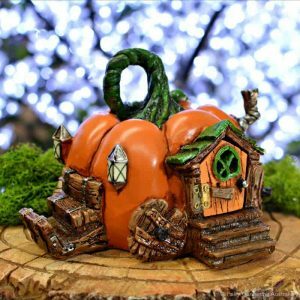 Check out our range of fairy doors here and fairy homes here. 2. Become a fairy, really! Picture your “fairy self” opening the door in the morning. What do you see? Are you overlooking the garden from your position high in a tree? Do you see a winding path leading down to a letterbox? Do you see a comfy seat by a tranquil pond where you can ejoy a cup of tea? What you see is your next step. Choose your elements. Hardscape elements like footpaths, fences, gates and retaining walls will help with the design of your landscape. 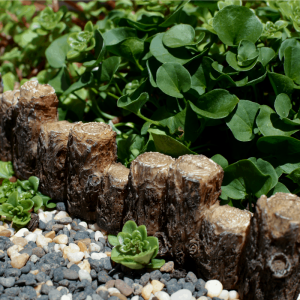 Ponds and bridges, decorative signs, toadstools – each addition will personalize your landscape. Accessories will further tell your story. A playground and bicycles might be found in a garden inhabited by fun loving family fairies. A garden shed filled with tools might be the happy place of a fairy who loves to tinker. Populate your garden. Fairy gardeners tend to fall into two groups – those who include fairy figurines and those who do not. 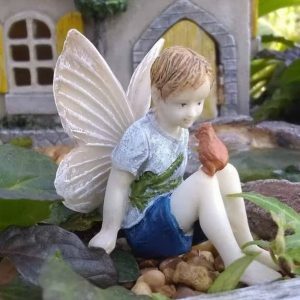 Some fairy gardeners love to see gorgeous figurines in different poses in their garden. Other fairy gardeners prefer the “real” fairies to live in their gardens and do not add any figures at all. Animals, dragons, gnomes, wizards and mermaids can make excellent companions on your fairy garden adventure. You do what feels right for you. Children all learn in different ways. Make sure your fairy garden caters to the way your child learns best. For example, if your little one likes to make lots of noise, think about adding bells, windchimes, vertical pipes and stick to tap them, etc. If your child learns through touch and feel, cater to them by offering a variety of textures that will stimulate their senses. Create areas with sand, smooth pebbles, coarse pebbles, water, etc. Perhaps add some satin flags or bunting. 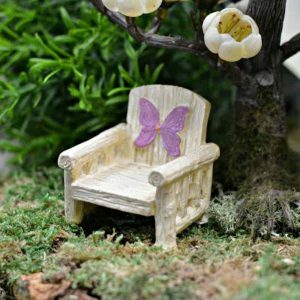 Remember that our products are here to compliment your fairy garden and should not replace items that you can make yourself. Air drying or polymer clay can be used to create lots of little things. Children love making all sorts of items to add to the garden. Gather seashells next time you are the beach and build a retaining wall out of them. Collect beautifully shaped pebbles and turn them into stepping stones for the fairies. Keep a box of natural materials, glue and wire on hand so that creativity can begin whenever inspiration takes hold. Each time I begin a new fairy garden with my daughters, we grab the pencils and paper. We talk about our ideas and draw a plan for the landscape. We never really follow the plan but we have loads of fun doing it anyway. Give it a go with your kids! Over time, your garden will grow. As a result, single houses can become a village, small structured landscapes can reach out to other corners of your back yard. Your story will become an epic tale filled with heart-warming encounters and victorious achievements. Encourage your kids to keep a journal and log everything including photos, plans, stories, drawings, etc. (adults should do this too) Don’t forget to add a copy of our fairy garden tips and other learning pages to your journal! Children should ALWAYS wear a hat, sunscreen and protective clothing in the garden. Ensure that the pieces in your fairy garden are age appropriate. Our products are recommended for 3+ years.It’s the responsibility of caregivers to choose appropriate products considering the child’s age and stage of development. Many of our products have stakes for secure positioning or small parts. Children should be supervised at all times. We clearly state that our products are ornaments and they are designed for decorative use. You will never hear us refer to them as toys. Take me to the fairy garden gallery for more inspiration! I am feeling inspired and have a question. Can I speak to a human?